I’ve talked about the photographic representation of the Occupy movement previously so this book makes a an interesting addition to the subject. 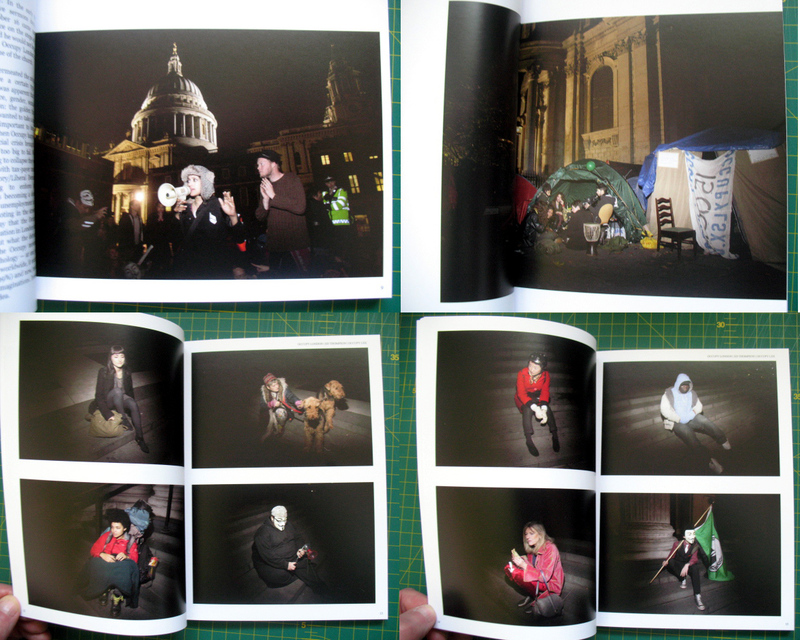 Made by photographer Ed Thompson, this small self-published book is focussed upon the nocturnal aspect of the Occupy London encampment during 2011. This was particularly contentious in London as elements of the mass media continually suggested that the protestors were mere day-trippers who went back home at night rather than being prepared to rough it overnight. Whether or not people sleep in a tent or in bed is irrelevant to the actual political message being disseminated but in such situations the weaker party (the protestors) have to be squeaky clean. Any tiny aspect that can be used to undermine the credibility of their message is blown out of all proportion. While the fiction is promulgated that the right to protest is enshrined as a cornerstone of liberal democracy, the reality is that mass public demonstrations and gatherings will always be viewed as a threat by those who hold the levers of power. Over the past decade or so there has been a steady erosion of civil liberties in the UK that can, in part, be traced back to the widespread public disquiet surrounding the Iraq War of 2003. This has meant that public protest has increasingly been presented as a near-criminal activity. While the legal framework surrounding the right to protest may present it as being perfectly legitimate and permissible, the fact that the subjects of protest (governments and other powerful institutions or bodies) largely define the boundaries of legality/illegality gives them a lot more power. This power can be used to undermine public expressions of discontent through redefining events; minor aspects of bad behaviour within a crowd become a threat to public order that requires more “robust” policing. Or sanitation and health & safety issues suddenly become an excuse for the dispersal of protest encampments. As long as they don’t alienate middle class opinion through disproportionate displays of over-reaction or violence, the authorities usually get away with such measures. The 1960s were the high point in mass-protest and counter-culture movement, largely as a reaction against the stifling orthodoxy imposed by a previous generation (itself traumatised by world war) as well as the omnipresent danger of nuclear annihilation that served to undermine the credibility of those in authority (their bungling incompetence had stoked the creation of a horrific balance of terror between East and West so their credibility to rule us was shot). But, the high hopes of the 1960s were followed by the stagnant 70s, the free-market 80s, the end-of-history 90s, the booming, globalised 2000s, and the current aimless slump. While the mass protest of the 1960s undoubtedly produced social change the political system adapted and survived. It did so by accommodating calls for change within the political system (the “inside” versus “outside” the tent argument) and negating the effect of radical politics. So successful was this strategy that many of the young radical figures of the 1960s and 70s are today’s stuffy politicians. Or to use a simpler term: they sold out. In this context, we no longer believe in the idea that we can change the world through sweeping mass political action. Instead (in the developed world) we are seeing the emergence of movements based upon single issues, such as climate change or aspects of economic injustice, which maintain support for a limited period. In the short term, an established political system is well able to deal with such challenges through the tried and tested processes of negotiation or compromise. However, in the long term, our growing scepticism in the ability of politics-as-usual to respond to the growing challenges of societies which have long since outgrown the simplified answers that structures based upon eighteenth century ideas of rational governance can provide, means that the scope for alternatives will grow. What form they take is anybody’s guess. In part this can be seen in the presence of the Guy Fawkes masks that appear in many images of protest we see from around the world. Here, a historical figure associated with a failed plot to destroy the English parliament, is recontextualised as an icon of protest for today. Furthermore, the fact that the mask, popularised by a Hollywood movie and sold on Amazon, has appeared throughout the world in such situations demonstrates how much has changed between the 1960s and today. Nowadays, protestors incorporate motifs from Hollywood (the main cheerleader of the capitalist dream) in their rejection of capitalism, a paradox that is striking in itself. 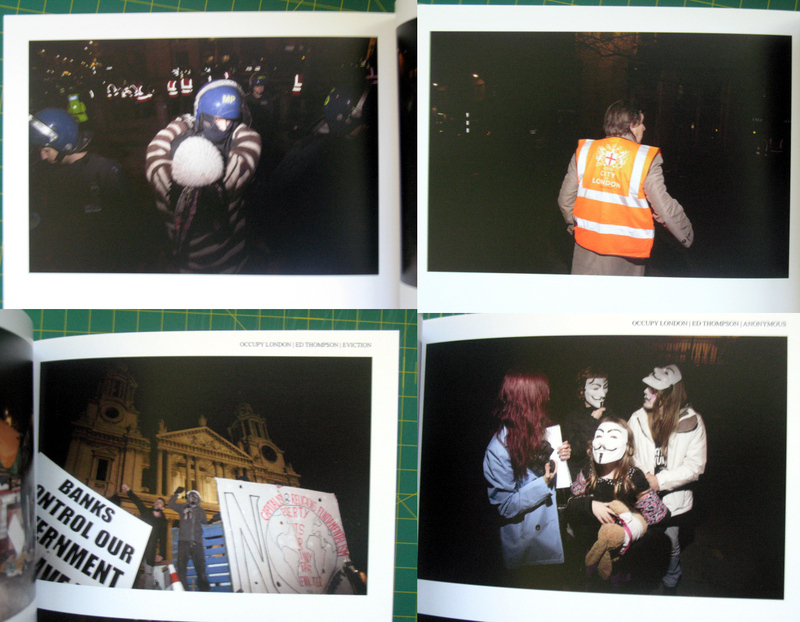 Unlike much of the other photographic work that has examined this subject, Thompson has solely focussed on the protest at night (like Occupied Spaces by Ben Roberts). Here, through Thompson’s effective use of chiaroscuro, individuals and groups are shown highlighted against the darkness that surrounds them. In his introduction, Thompson references Caravaggio, a comparison that sets the bar quite high. 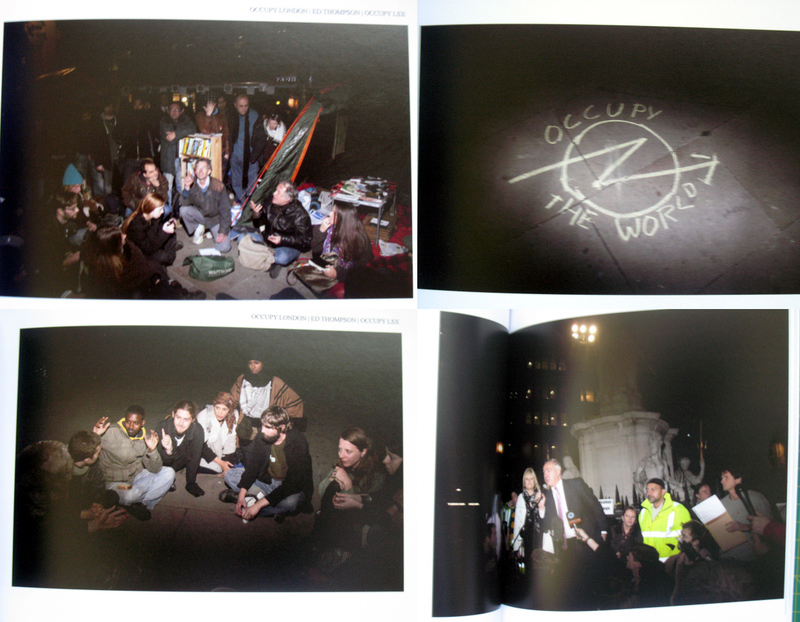 Thompson’s images show us the evolving Occupy movement grow in size and complexity as more and more disparate individuals are drawn to this experiment in social organisation. Far from the night being a time of dispersal and inaction, Thompson’s photographs show us a place of vibrancy and activity. There is also a seductive grandeur to these images (not captured by the lousy images shown on this blog post) due to this interplay between light and dark. Returning to Caravaggio, Thompson’s photographs do work well in evoking and recontextualising the representative conventions of Christian iconography and history painting in a new setting. Thompson presents us with scenes of “great deeds” as the forces of good versus evil are locked in an epic struggle for the soul of London (and the world). 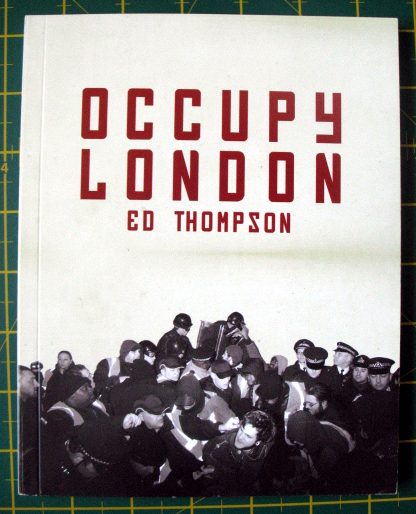 This book uses a number of different elements to produce a narrative of the Occupy London which attempts to capture the aspirations and enthusiasm of this complex gathering of disparate individuals. 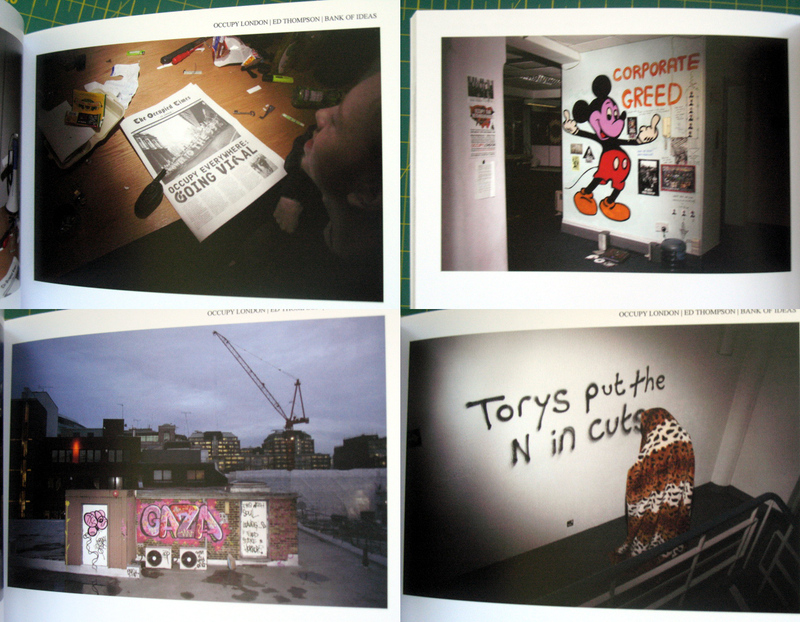 It reproduces short texts from a number of those involved in the movement that examine a number of issues, including what was achieved, as well as the legal debates and battles surrounding the nocturnal eviction. Through the effective use of typography, photography and design, the book is a sophisticated attempt to delve deeper into the layers of this event and it does so very effectively. 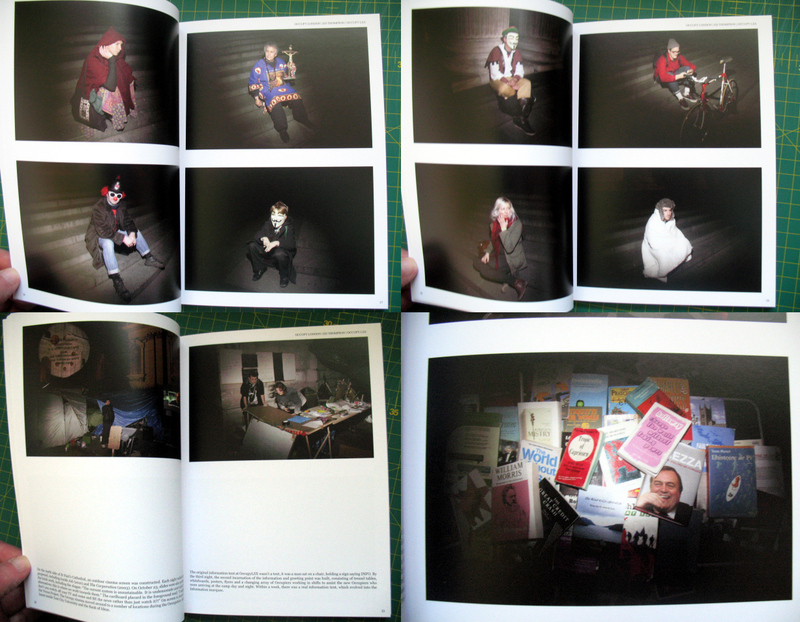 The only aspect I would change would be the size – the images have a grandeur that a bigger book would convey. That being said, it is a very important book about a period of recent history, the ripples of which will undoubtedly emerge once again in the near future.